NOTE – What a difference a day makes – especially in TEXAS! Six inches of snow in Dallas-Fort Worth, and temperatures briefly hitting the freezing mark here in Houston. What next? “Cats and dogs … in heat!” At least it’s not snowing in Houston (they think they’ve got it bad now), and I heard the melt is on in North Texas. Had enough yet? Maybe you should watch this week’s Texas Fly Fishing Report, and look toward spring. 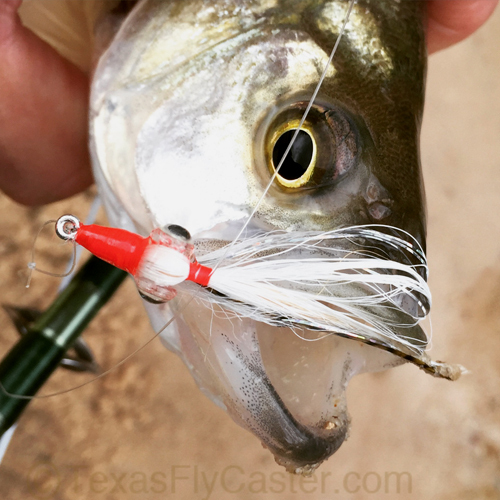 If you watched the video report then you know that today, we’re looking at yesterday’s fly fishing just off Lake Houston around New Caney, Texas. I was able to get about three hours of fly fishing in along the creeks running down through the Houston Wilderness Park on the north side of Lake Houston, and although it doesn’t qualify (in historical terms) as a HOT SPOT … maybe this is what hot spots are with the new normal of water, rain and spring rains here in Texas, yes even here in this part of East Texas. In the limited time and limited area I covered inside the park yesterday, I can say that it’s extremely clean, there is plenty of signage, and the people working there are very helpful. When it comes to actual fly fishing conditions though, I was somewhat surprised to see the same conditions we see in North Texas right now – the creeks are running several (looks like 10’) lower than they have historically run, and locals I talked to were pretty up front when talking about the “good old days” when the spot we were standing on was under several feet of rushing water. The location I am talking about is at the end of Canoe Launch road, and is a place that’s well worn by all the traffic that fishes there. Going into the park, be sure to get a map when you pay a Lincoln for admission. Surprisingly, the mapping on Google Maps was spot on inside the park! So, if you want to phone your way in to the circle parking (ostensibly for canoe / kayak launch) – I can say trust your phone (ATT service). Remember that since the creeks are so low, there will be limitations to how far sand bass can go up these creeks! Some of these pools are connected by long runs of water that is barely running and six inches to a foot deep. If I were a sand bass, I would not want to expose myself to that kind of gauntlet. But, either some have exposed themselves, or have been caught shallow in these pools (as water dropped) and are pooled-up along Peach Creek. The confluence of where Caney Creek meets Peach Creek looks to be a fantastic spot with enough water to make for an entire day of catching sand bass. I was only able to spend about an hour there, and bushwhacked across Peach to get to that spot. It’s not nearly as far to that confluence as you might think – probably less than 300 yards, and well worth wadering-up to cross over. You have to take a good hard look at the pool you may want to fish, and ask yourself a few questions. If you were a fish, would you want to be here? How would you have gotten here? What I saw was the fish are in pools that had a bottomless (deeper) look to them. And even though I couldn’t actually see them, they were there by the dozens. Wading and crossing over to get to different pools will definitely increase the number of pools you can take a look at, and rule out. At some point, with these water levels, it makes no sense to me to go further UP, and more sense to go further DOWN toward the lake. Cast your fly to the very end of a pool’s downward flowing current, and give it time to work its way (down) through the water current and get a bit deeper. I didn’t see any real pattern to the strip, but long and slow was a little better than the other methods, and gave them time to set the circle hook themselves (remember? tie on a white/white jig hook Clouser). And there are some so small that they weren’t even able to get a hook’s worth of fly in their mouths, so just pull on through those guys. These fish are stacked, so hitting the same exact spot, after a quick fight and release, is no big deal! Feel free to pound it. The other spot I went to, outside the park, was a little further east from the park on 1485 and dropped down into a “neighborhood” if you want to call it that, and parked to have a look at what turns out to be the East Fork of the San Jacinto River. The parking spot is at 30.135491 X 95.128796, and is essentially on top of abundant, vast illegal dumping grounds. What looks plain enough on Google Maps, is actually an edgy area with few upright and plumb houses. We’re talking trailer houses being lived in, doors wide open, or no doors, various autos from various eras – on blocks or half skeletonized, reams of plastic stripped clean of their copper contents … and then you drop down into the river to fish and find dads with their kids, friendly conversations … what a juxtaposition. If you have any questions, feel free to ask. Thanks for subscribing to this read, and let me know how it works for you!